Limited edition release from veteran Hip Hop producer K-Def. 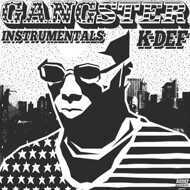 Instrumental versions of Def's critically acclaimed "American Gangster" Remix project from 2007 (Voted best Jay-Z remix album by HiphopDX). The album includes 15 masterfully composed tracks with sounds ranging from soulful and haunting to up-tempo party vibes.